BRUCE (Brousse), JOHN, Métis carpenter, president of the provisional government of the Red River settlement (Man. ), office holder, and judge; b. 1837, son of Pierre Bruce and Marguerite Desrosiers; m. Angélique Gaudry, and they had five children; d. 26 Oct. 1893 in Leroy, N.Dak. 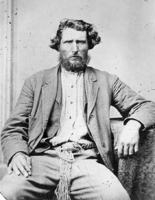 John Bruce has been described as a “figurehead” in the Métis movement of 1869–70 in the northwest, but evidence seems to suggest that he was a man of some prominence who had ideas of his own as to the future of the Red River settlement. He was a carpenter and, although not particularly well educated, assisted fellow Métis in presenting cases before the courts of Assiniboia. In 1869 he was working for the firm of Andrew Graham Ballenden Bannatyne* and Alexander Begg. 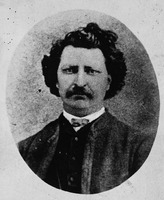 At the beginning of October that year he met with Louis Riel* and three other Métis, probably François-Xavier Dauphinais, Pierre Poitras, and André or Jean-Baptiste Beauchemin, in the court-house just outside Upper Fort Garry (Winnipeg) to form a committee to prevent the lieutenant governor designate, William McDougall*, from entering the settlement until the Canadian government had guaranteed that the rights of the inhabitants would be respected. Riel and Bruce subsequently attended a meeting at the home of magistrate Thomas Sinclair in the parish of St Andrews, in an unsuccessful attempt to persuade English-speaking mixed-bloods to oppose McDougall’s entry. 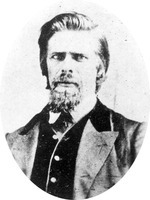 In mid October Bruce was elected president of the National Committee of the Métis and on 8 December, when a provisional government was proclaimed by Riel, he became its head. He occupied the latter post until he resigned on 27 December, citing poor health. There was speculation concerning divisions of opinion among the leaders of the government. In a letter to Le Courrier de Saint-Hyacinthe in February 1870 Bruce denied the existence of such divisions, but hinted at his own opposition to the settlement’s becoming part of Canada rather than of the United States. He remained on the governing council, serving as commissioner of public works. Under his direction the ice on the Assiniboine River was cut away from the pontoons supporting the bridge so that the spring breakup of 1870 would not remove it. Repairs were made to other bridges. 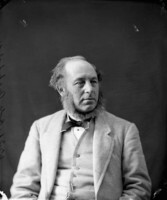 Although Bruce later denied further participation in the provisional government, he was at Upper Fort Garry in July 1870 and privy to Riel’s activities. He wrote to Bishop Alexandre-Antonin Taché of the problems faced by Riel in coping with Indians who came for help in response to promises made to them during the winter by anti-Riel agitator John Christian Schultz and by agents of McDougall. He also knew of the arrival of Captain William Francis Butler*, an intelligence officer for the Red River expeditionary force on its way to the colony under the command of Colonel Garnet Joseph Wolseley*. 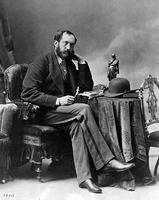 Bruce did not accompany Riel and Ambroise-Dydime Lépine* when they fled on the arrival of Wolseley’s troops. 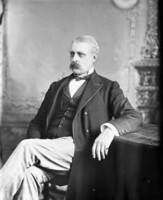 He remained in the settlement and was appointed petty judge and magistrate by Adams George Archibald, Manitoba’s first lieutenant governor. Bruce appeared as a key witness at the trial in 1874 of A.-D. Lépine, charged with the murder of Thomas Scott*. Le Métis referred to him as a “Turncoat and traitor,” because of his testimony against Lépine. Some time after 1874 he and his family moved to Leroy. In early 1892 he fell ill and wished to become reconciled with his church. He wrote to Taché, saying that he had listened to poor advice and asking for forgiveness. He died at Leroy, and was buried in the cemetery of the Roman Catholic church. Study of John Bruce sheds new light upon the varying shades of opinion which existed both in the provisional government of 1869–70 and in the tormented Métis community of later years. Arch. de l’archevêché de Saint-Boniface (Saint-Boniface, Man. ), Fonds Taché, T6969, T7752, T9278, T48449–51. NA, MG 26, A, 102; 187–88. PAM, MG 14, B26. PRO, CO 42/689. St Joseph’s Roman Catholic Church (Leroy, N.Dak. ), Reg. of burials, October 1893. Begg, Red River journal (Morton). Can., House of Commons, Journals, 1874, app.6. Preliminary investigation and trial of Ambroise D. Lepine for the murder of Thomas Scott . . . , comp. G. B. Elliott and E. F. T. Brokovski (Montreal, 1874). Louis Riel, The collected writings of Louis Riel, ed. G. F. G. Stanley (5v., Edmonton, 1985). Le Courrier de Saint-Hyacinthe (Saint-Hyacinthe, Qué. ), 5 févr. 1870. Manitoba Free Press, 18 Oct. 1873. Manitoba News-Letter (Winnipeg), 11 Oct. 1870. Le Métis (Saint-Boniface), 9 nov. 1871, 5 déc. 1874. New Nation (Winnipeg), 1, 8 April 1870. Nor’Wester (Winnipeg), 26 Oct. 1869. The genealogy of the first Métis nation; the development and dispersal of the Red River settlement, 1820–1900, comp. D. N. Sprague and R. P. Frye (Winnipeg, 1983). Pioneers of Man. (Morley et al.). George Dugas, Histoire véridique des faits qui ont préparé le mouvement des Métis à la Rivière-Rouge en 1869 (Montréal, 1905). N. E. A. Ronaghan, “The Archibald administration in Manitoba – 1870–1872” (phd thesis, Univ. of Man., Winnipeg, 1986). N. E. Allen Ronaghan, “BRUCE, JOHN (1837-93),” in Dictionary of Canadian Biography, vol. 12, University of Toronto/Université Laval, 2003–, accessed April 22, 2019, http://www.biographi.ca/en/bio/bruce_john_1837_93_12E.html.